We are less one appendix around here! I am so happy! We came home yesterday which was a record setting hospital stay of less then 24 hours!!! Mr 11 is doing well. He has had a low grade fever that broke this afternoon and has not needed pain medicine since this morning. He is still a bit sore but that is to be expected! I woke up on Friday morning to 4 missed calls from my best friend in AZ. I was worried so I called her back and she asked me if I was ok. Yes, I am fine..... are you ok. I had no clue what was going on until she told me about the shooting. She just wanted to make sure that I was at home. I assured her that I was and I proceeded to my TV for about 10 minutes before my kids started to rise and the TV went off. As I drove to the hospital a few hours later I had tears in my eyes as my mind was trying to process what had happened in a movie theater which I have taken my kids to many times. I tried so hard to instead focus on my son who had no clue what had happened just a few hours earlier. I tried to keep the tears at bay so that he would not think I was crying out of fear for him and also so I would not have to explain why I was upset. He did not catch on and I was able to hold off telling him about what had happened until after we got home yesterday. It has been a long few days. Pray for Aurora and please pray for Mr. 11's continued recovery! While we were at the hospital I was able to see a couple of wonderful women who I met the last time we were in the hospital. Both of their children are fighting cancer. One had been home and was back for another round of chemo and another had not yet left. These woman are some of the strongest women I have ever met! As we talked it was brought to my attention that we were DONE with this era of our lives. The appendix was gone and there would not be any reason to need more hospital stays or complications in Mr 11's gut. Until this was said out loud the thought had not yet crossed my mind.... WE ARE DONE!!!! 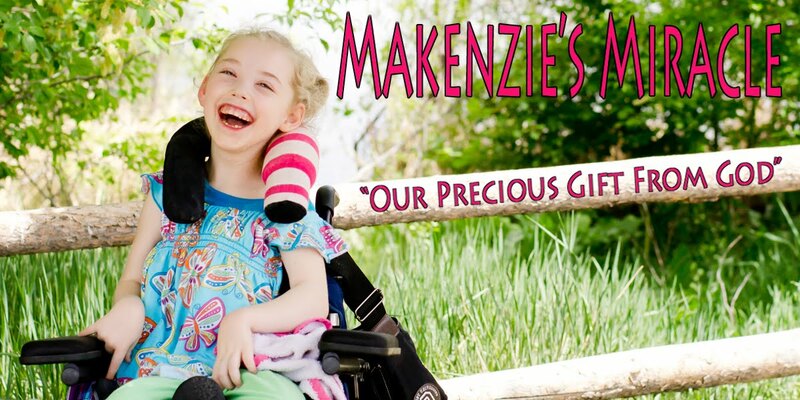 This got me thinking about not only this journey but also Makenzie's journey. Makenzie's journey started at the very same hospital where Mr 11's gut was finally fixed. In 5 years this hospital has changed a lot. They have remodeled and set up a completely separate pediatric hospital since Makenzie was a resident of their PICU. We left the PICU after a week to go to Children's Hospital for their rehab program and have continued all of Makenzie care there never to look back until now. I have been very unhappy with the care my children have received at Children's for a very long time. I can honestly say that every single thing that has helped Makenzie was brought to the table by me. I suggested the GJ tube. I asked for the up in reflux meds. I came up with her blended diet recipe. I have come up with her treatment plan for as long as I can remember and have really only used their perscription pads to get what Makenzie needed. I also can not tell you of one time I have taken my kids to their emergency room when they have correctly diagnosed my kids. I have "complained" more times then I can count and only one time did I see any change. The one time someone listened to me it was over a maintenance issue in the parking lot and even that took two "complaints". I can not continue to advocate for my kids in a hospital that could care less and only wants to hear from people who want to praise their institution. Not once have I been invited to sit on a parent board or been asked to express my concerns to any department even though I have requested to be heard. I would love to speak to their med students about what I have experienced and explain to them from a parents perspective how I think they could better care for our children but..........they don't want to hear it. I have been contemplating this for a long time however even though I was unhappy it was what I knew and I felt safe there in a weird kind of way. I at least knew how their system worked and where everything was. It was familiar and changing was scary. However, we have now been to the other hospital 3 times now. I understand their system. It is not a teaching hospital. Each time we went I saw the same nurses and they remembered us. Everyone was so kind and willing to listen. I have been nothing but happy there and most importantly my kid got the care he deserved EVERY SINGLE TIME! So with that said, over the last couple of weeks I have set up appointments for Makenzie to go see new doctors. I have changed my hospital of choice on all of her forms and have peace about all of it. We will go see a new ENT, GI doc, orthopedic surgeon, and rehab doctor. I have also set up a repeat swallow study considering Makenzie is still doing a fabulous job of eating! It feels so good to know that in one short month I will have no reason to EVER walk back into a hospital which could not even make a simple apology for their gross negligence when it came to Mr. 11s misdiagnosis and at this point has done my children more harm then good! I wish I would have done this a long time ago! We had to do this to with my son's cardiac and neurological care. I was so nervous, but it was THE best decision we ever made. (((Hugs))), prayers, and congrats for changing. hi, I met your son and Makenzie at doctor Rothenburgs office at RMHC. I was the mom with a young baby and I came over and asked if Makenzie was born with something special...you told me about her cracker story. You were actually there for your son. Anyway, I blogged about it and remember sweet Makenzie so well. I'm also doing ABM with Andrew Tarr- i saw that you are or were going there too. And, now with this blog, I wanted to share that we have many of Lucia's doctors at RMHC- so if you want to talk about any of our experiences there, we've been going there for about 15 months- i'm more than happy to share! I'm going to read your blog but saw something about stem cell and would love to learn more about that! Thanks !